Functional, secure and conversational, the creatively styled RackiT™ Lock Rack makes finding bike parking fun. The innovative enlarged lock provides a highly secure two point wheel frame locking for one bicycle. Lock Racks are great for areas with space constraints and when used in multiples it creates a dramatic and unique statement. 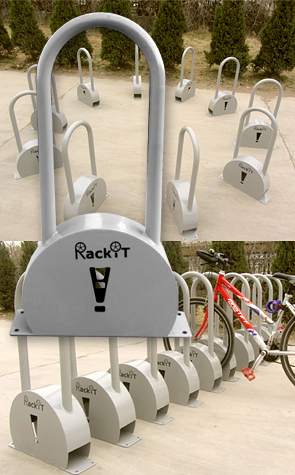 RackiT™ galvanized steel bike racks are maintenance free, weather resistant and sealed with a high quality silver powder-coated finish. These one of a kind racks are simple to use and install, great to make a statement at parks, home, apartment or schools.